We've all been talking about the restructuring of APLD membership categories. We've heard about the importance of advancing the profession of landscape design through higher professional standards. What does this mean for the individual member? The membership changes reflect the need for our industry to grow and adapt to a continually evolving working environment. In the fifteen years I've been a landscape designer I have faced the need to re-educate myself on a wide variety of topics and issues in order to effectively practice in my chosen field. I have seen significant climate fluctuations, requiring me to alter my plant palette, to reduce water use and to enhance my knowledge of soil science. I have had to learn to identify new signs of plant stresses and the insects and diseases that accompany our warmer growing season. In recent years I have watched the influence of social media on communication and advertising and have struggled to stay current with the vocabulary, not to mention the astonishing array of software and application choices available to us. My clients are also changing to adapt to this environment. They are comfortable with rapidly changing technology, and that has increased expectations. My clients are more sophisticated—they know what good design is and they also expect renderings, 3D views and professionally designed websites. They seem to be able to master complicated apps on a lunch break. With economic and environmental changes there have been new threats and complications that affect our practice of landscape design. Designers in other states have experienced legal changes and limitations to their right to practice. In our own state the regulations affecting storm water change frequently, becoming more and more restrictive and intrusive to residential design. The City of Seattle repeatedly changes the landscape permitting process, generating constant confusion and many questions for our chapter forums. 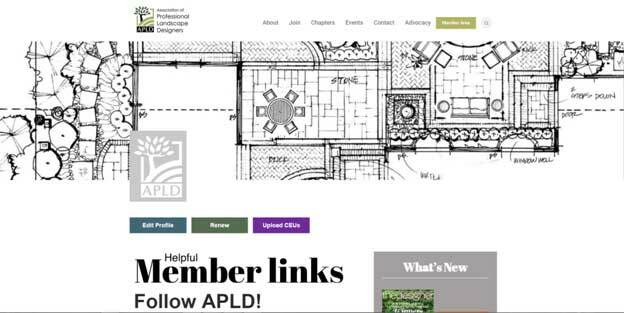 A professional landscape designer has to work hard to remain informed and relevant, and I am pleased to see that this effort is acknowledged within the restructured APLD membership categories. The associate and professional levels of membership now include requirements for continuing education, which I view as a means of honoring our commitment to professionalism. The requirements will not be difficult for most of our chapter members to meet. Beginning in 2016, Associate members (those who have been practicing landscape design for less than three years) must acquire 15 CEUs (Continuing Education Units) within a three-year period. Professional and certified members are to obtain 30 CEUs in that same timeframe; certified members have an additional requirement to obtain a minimum of 5 of the 30 CEUs within the topic area of Sustainability Practices. There are abundant resources in the Seattle area for CEUs. The Washington chapter is blessed with an exceptional Programming Committee. These dedicated members develop monthly programs related to professional growth, design, business development and legislative advocacy. The annual APLD International Landscape Design Conferences are a great way to have fun and earn a large portion of your yearly requirement. 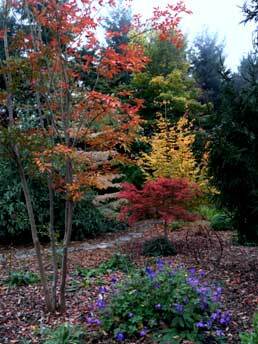 Professional organizations such as the University of Washington Botanic Gardens' ProHort program and WSNLA's PRO Series present many educational classes and seminars that have been pre-approved for APLD CEUs. Seattle Public Utilities, along with Edmonds and South Seattle Community Colleges, offer professional-level course work. Marenakos, the Hardy Fern Foundation, the Bellevue Botanical Garden and the Northwest Horticultural Society also occasionally hold events that are oriented beyond the home gardener and toward the professional landscape industry. Outside of the Seattle area, the Oregon chapter of APLD has many excellent, pre-approved events. The Oregon Nursery Association's annual trade show, the Farwest Show, features several days of pre-qualified seminars and lectures. Oregon State University offers online horticultural coursework. The International Society of Arboriculture also has an annual international conference and trade show with some events that qualify for APLD CEUs. If a class or seminar is pre-approved, it means that the organizer has provided APLD's national office with an agenda and a detailed description of the event so that APLD can assign an exact number of CEUs to the event. If an event is not pre-approved, it means that you will have to submit an agenda and a detailed event description yourself. The criteria for how CEUs are assigned are somewhat complicated, but basically one CEU is earned for each hour of study. Please refer to the APLD Policy Manual, in the members' area of the website, to learn more about how CEUs are assigned. Before submitting courses, designers should ask themselves whether the knowledge acquired by attending a lecture, workshop, conference or field trip will make them better designers and whether it will cover material they do not already know. The program must be geared toward the professional, not the home gardener. Travel time and meals are not included. One half a CEU is awarded for drawing workshops, advanced graphics workshops, advanced design workshops, design problem-solving and educational garden tours. Until recently, most coursework in the Seattle area had not been pre-approved for CEUs. Those of us who are certified have always been required to obtain CEUs. We typically found it easy to obtain extra CEUs, and this saved us the trouble of trying to precisely quantify each class. Click here to download or print these instructions. I maintain a folder on my computer for my CEU data where I keep scanned copies of the agendas for all the classes I take. The agenda helps me estimate the CEUs I have earned—it will typically also identify the breaks and meal times that I subtract from the total hours. For classes that are not pre-approved by APLD I also scan copies of other documentation, such as a detailed course description. Each event file is labeled with the date first to make it easy to find. If you are not able to scan documents, ask the organizer to email you the information. 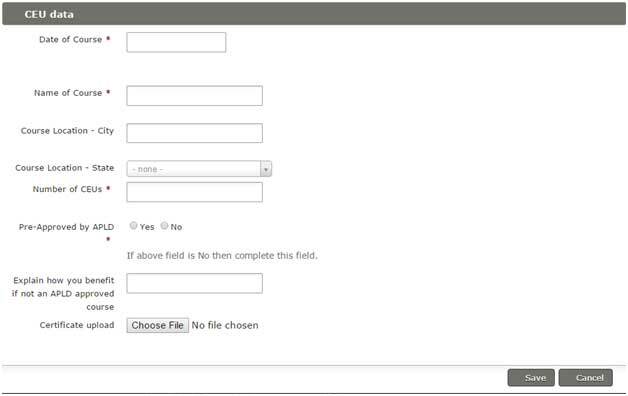 Copy the information into a Word or other document file and save that. As with all important records, it is critical that designers maintain separate records in case the website malfunctions. Click here to download or print this page. I want to emphasize that it is not difficult for a designer to obtain the required number of CEUs. 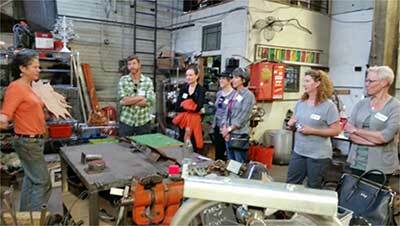 For engaged landscape designers, continuing education is part of our culture. Education is the means by which we continue to be informed and inspired. It’s what we do.